On 24th June we said farewell to parishioners Alroy and Liomia Hoffmeester and their children Leah and Lio as they returned to their native South Africa for employment reasons. I think they found the decision to leave Ireland a difficult one and Leah, according to reports, is missing her Irish friends. Hopefully by now she is settling into her new school. Alroy had just agreed to take on the role of Churchwarden for the second time. We are very grateful to Colin Ackrell who has agreed to take over from Alroy. Colin and his wife Rita, who sings in the Music Group, were married here in St. Maelruain’s in May this year. We had the cutting of the hedges in the graveyard on 26th June in preparation of the Dominican blessing of the graveyard on 1st July. Thank you to Billy Gould, who rounded up members of the Bowls Club to help and to John Donoghue who organised for the Boy’s Brigade leaders to help along with myself and our respective sons. The graveyard looks in great shape now, many hands make light work. Thank you to everyone who turned out to help. The funeral of Vic Saunders took place here in St. Maelruain’s on 8th June and on 14th June we had the funeral of Norah Quinn. We extend our condolences to the families of both these ladies. On 27th July we had the wedding of Natalie Ayres and Chris Raymond. Congratulations to you both and we wish you every happiness in your future lives. On 29th July Paudie Rigley was baptised, he is the son of Mark and Hilary (nee O’Halloran) Please pray for Paudie as he begins his Christian life. On 3rd August I headed out to Uganda with a team from Fields of Life. We spent our first 5 days in Nakasongola, which is in central Uganda. We stayed in a children’s shelter called New Beginnings and ran a camp for Leaving Cert age + students in the nearby Bethel Royal High School, which is a Fields of Life school. Eight other Fields of Life schools joined us. It was eye opening to see the faith these young people have in God. We then travelled onto Lira, which is in Northern Uganda, seeing the very fast flowing Nile along the way. We stayed in Lira for a week while painting Truth Primary School which is also a Fields of Life school. We painted a lot more than was expected in the four days. On our last day in Lira we travelled even further north to Pador Palwo, where we saw areas where people had been moved to during the reign of Kony and the LRA 20 years ago. Our last day in Uganda was in Kampala, the country’s capital, we had the opportunity to visit a slum which was just like you would see in a documentary. I would like to thank everyone who supported me financially, by providing school or painting equipment or by remembering my team in prayer. On Sunday 26th I presented two collection baskets to the church in thanks for this. BB will re open on Friday 21st September in the parish centre at 7.30 pm for all sections. We hope everybody enjoyed the summer break and managed to get some sunshine at some stage! We are looking forward to seeing all our old members back and hopefully, some new faces too. All current members will receive notification by post along with their consent forms for the new session. Please be sure to bring the consent forms on the opening night. Subs for the coming year remain the same as last year and are due on the opening night also. BB is open to boys between the ages of five and eighteen. Activities include drill, gymnastics, stories, drama, crafts, dodgeball, Christian Bible study, hiking and various outings throughout the year. Why not give BB a try and bring along a friend. For further information ring John at 4522930. 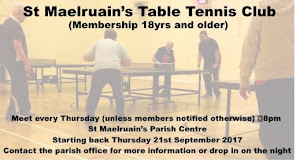 The table tennis club will re open on Thursday Sept 20th at 8pm. We are currently looking for new players of all standards for an informal game of table tennis followed by tea, biscuits and a chat! We also have teams in the United Churches Table Tennis League for the more serious players. I hope all our members and friends had an enjoyable break. 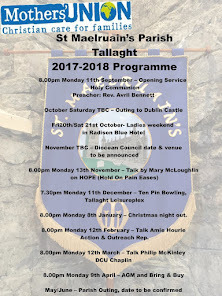 Our agenda for the coming year will be launched following our opening service on Monday 10th September at 8pm when once again Rev Avril Bennett will officiate. If you care to join with us – you will be assured of a warm welcome and friendship! SAOIRSE would like antibacterial hand wash for our September donation. TEA ROTA 10th September: Mary Lucas / Hendrikja Mahon. We will hold our celebration of “Mums in May” tea party on Sunday 23rd September following 11am Morning Service. Also on 23rd September at 3.30pm in Christchurch Cathedral one member will represent our branch at Choral Evensong of Thanksgiving to celebrate 125 years of Mothers’ Union in Ireland. Mothers Union Anniversary dinner on Friday 28th September in the Springfield Hotel, Leixlip – there are still places available, details from Valerie or Miriam. On Saturday 13th October we plan to visit Rathfarnham Castle to view the Berkeley Costume and Toy Collection, a collection of 18th and 19th century toys, dolls and costumes. Finally, please note date 1st November for 11.15am service in Christchurch Cathedral when our branch will be included along with Malahide and Finglas. Drop in for a cuppa and a chat. Ladies and Gents are invited to bring along old photographs of our Parish groups and events from yesteryear for our Memory Table. Were you one of Ninty’s playgroup mums? Did you stroll with the Strollers? Do you remember the Knit-ins, or the Mens’ Group, and those halcyon pre-fab days? 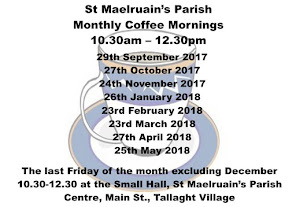 Join us on Friday morning 28th September in the Old Hall, 10.00am – 12.00 noon, refreshments €3.00, proceeds will go towards parish funds. members. New members are always welcome at our Club, join us on Tuesday and Saturday nights in the Parish Hall. The badminton club will start back on Monday 3rd September at 7.30pm. Come down and have a game of badminton and a cuppa. New members welcome. Our Whist Drives which successfully continued over the summer months carry on as usual. Our next Drive is on Monday 17th September in the small hall at 8.00pm. All welcome. 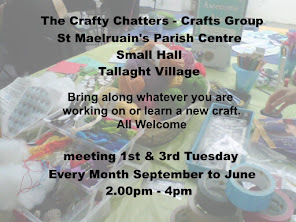 A craft group have been meeting over the summer months in the small hall. We are going to continue on over the coming session on the 1st Tuesday of each month from 2pm – 4.30pm. starting on 4th September. Come along with whatever craft you are working on, all welcome! The Good Book Club will continue to meet on Wednesday evenings in the Parish Centre where we study the gospel for the following Sunday. All welcome! Joe, who sings in our Music Group is looking for secondary school age kids + for the musical drama group ‘Now and Then’ for a production of ‘Joseph and his Technicolour Dream Coat’. 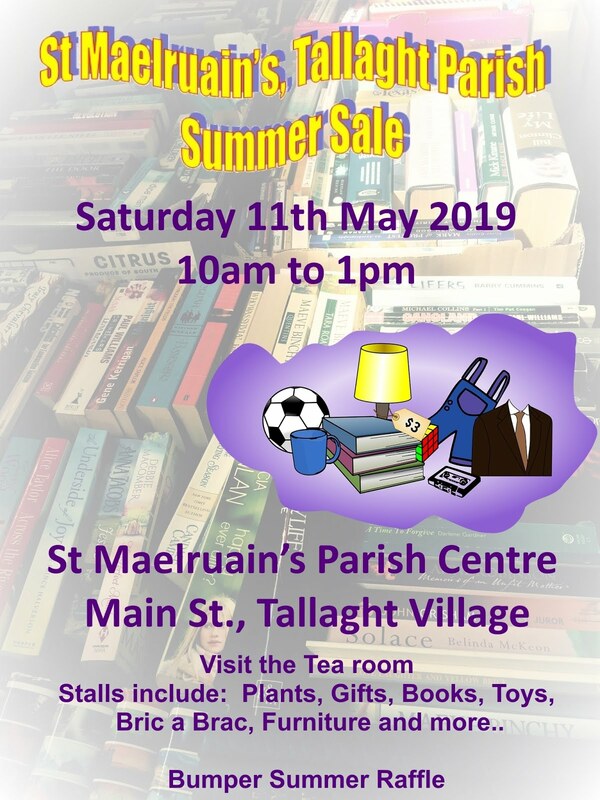 If interested, contact William on 086 803 0239.